Let's delve back into the world of food and recipes with two items today. The first is an undated yellow fold-out pamphlet titled "How to Make Corned Beef Burgers .. And 21 Other Wonderful Ideas with Canned Corned Beef." 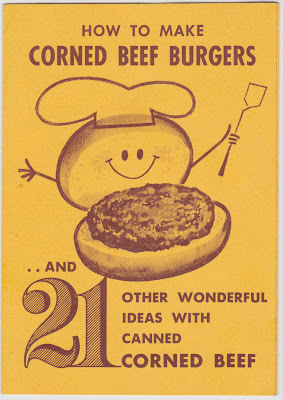 The smiling bun on the front is brandishing a spatula and looks pleased with his creation, perhaps unaware that he will soon rest atop the burger and be consumed. The pamphlet was published by International Packers Limited, which sounds more like a bunch of dockside workers than a company I'd want to buy family food products from. According to this trademark page, International Packers Limited distributed "canned corned beef, frozen veal, frozen beef, fresh lamb, frozen lamb, and frozen mutton, all for human consumption." Flake corned beef with a fork. Separate bread into soft crumbs; add to corned beef with egg; mix well. Grease individual custard cups and place a peach half in the bottom of each, cut side up. Fill cups with corned beef mixture and place in a shallow pan of water. Bake at 350 degrees for 25 to 30 minutes. Makes 4 servings. "Cheese is one food you don't have to worry about. There is plenty on hand now and indications are there will be more cheese and sharper cheese by Christmas time. "Cheese contains a good quality protein, important on the days when you must omit meat and eggs. It also offers calcium for bones and teeth, and riboflavin." Cut eggs into halves lengthwise. Combine white sauce, rice, half cup cheese and ripe olives and stir to blend. Pour half of this mixture into buttered baking dish, cover with eggs and sprinkle with salt and pepper; add remainder of sauce and sprinkle with remaining cheese. Bake in a moderate oven, 375 degrees, about 30 minutes or until cheese is melted. Serves six. Mash the beans and add the onion, butter, cheese, bread crumbs, milk and seasonings to taste. Mix well. Press into a well greased loaf pan and bake about 30 minutes in a moderate oven, 350 degrees. Turn loaf out on a platter and surround it with tomato soup which has been heated. Serves 6. 1. The reverse side of the clipping does have this handy tip: "Discolored Aluminum. Renew discolored aluminum pots by simply putting apple peelings in the pot, covering them with water and allowing them to simmer until discoloration has disappeared."